With over 300 square meters full of innovative materials, inspiring lectures, creative workshops and tasty coffee, the organizers have created a professional hub for designers, engineers and scientists to exchange ideas and discover whatʼs new. This yearʼs exhibition focuses on materials, products and services from around the world to inspire and enable a more intelligent and sustainable future. Lecture by Organoid Technologies. Photo: Aart Van Bezoyeen. Materials Café offers a five days program with demonstrations, lunch lectures and workshops to reveal materials stories and experience the exhibited materials and products. Whether it is by growing packaging or by inflating metal, the organizers wants to demonstrate that innovation requires us to rethink business as usual. Further more they have the vision to create more awareness for unknown materials and products among a wide and professional audience. New – or newly interpreted – materials and manufacturing techniques provide innovative answers to current challenges which we want to solve with green intelligence. Hello Materials Bloggers meeting up at the Materials Café. From left, Erik Haastrup Müller, Maria Hørmann and Aart Van Bezoyeen. 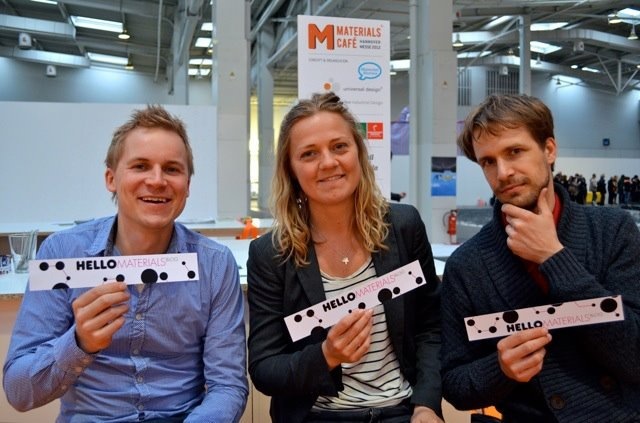 The Materials Café is an initiative by Thomas Bade (Universal Design Germany), Tim Oelker (Tim Oelker Industrial Design) and Aart van Bezooyen (Material Stories). The event is powered by the HANNOVER MESSE, Zieta Prozessdesign and the Leibniz University Hanover. 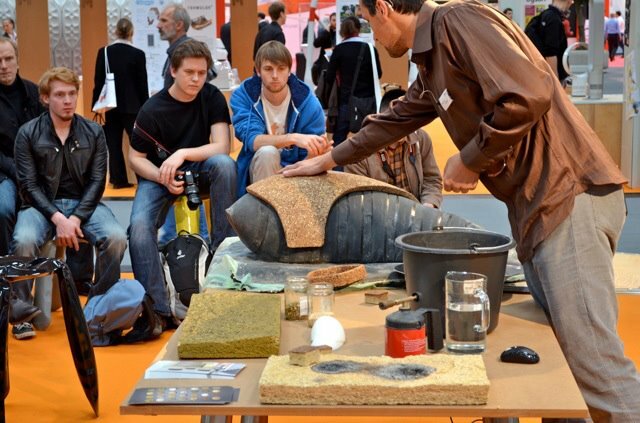 Stop by the Materials Café at the HANNOVER MESSE (Hall 6, Booth B 54) from April 23rd to April 27th, 2012 or join/like Materials Café on Facebook. …….Or stay tuned here for a ‘Hello Materials Blog post’ solely about the Materials Café.